July 10, 2013 So, it hasn’t been the best week for Al Jazeera, the television network owned by Qatar’s despotic ruling family, for the same reason that it hasn’t been a great week for the despotic ruling family itself: the ouster of Egypt’s president, Mohamed Mursi, the bumpkin fundamentalist. One of the correspondents who quit, Haggag Salama, accused his ex-bosses of ‘airing lies and misleading viewers.’ The journalist Abdel Latif el-Menawy is reported to have called Al Jazeera a ‘propaganda channel’ for the Muslim Brotherhood. It’s possible that some of the journalists who quit did so as a matter of self-preservation; the Egyptian military is behaving in predictably heavy-handed ways toward journalists it doesn’t like. But it’s also entirely plausible that they quit because they couldn’t abide Qatari government interference in their reporting. In a post from last week, we covered the resignation of the 22 members of the Al-Jazeera Egyptian bureau in protest over what they say were instructions from the management to “favor the Muslim Brotherhood.” As noted in that post, we had been warning about Brotherhood influence at Al Jazeera since 2007, long before the issue came to the attention of the major media and were the first publication to report on the subject. The GMBDW and its predecessor publication have also long and extensively covered Youssef Qaradawi, recently given a warm welcome by the new Emir of Qatar. Sheikh Qaradawi is the most important leader of the Global Muslim Brotherhood and is the de facto spiritual leader of the movement. He is also considered to be the “spiritual guide” for Hamas and his fatwas in support of suicide bombings against Israeli citizens were utilized by Hamas to justify their operations. 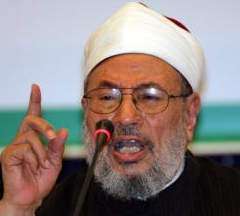 In 2004, Qaradawi turned down the offer to head he Egyptian Brotherhood after the death of the Supreme Guide. He is based in Qatar and has said the Qatari Emir has protected from being designated as a terrorist by the U.S. He has also reportedly amassed substantial wealth by serving as the Shari’ah adviser to many important Islamic banks and funds. Qaradawi is the head of the Union of Good (UOG), a worldwide coalition of charities helping to raise funds for Hamas and is the leader of the European Council for Fatwa and Research (ECFR), the theological body of the European Muslim Brotherhood.